Cavatelli is a typical Southern Italian homemade pasta with a unique tube-like shape. The dough is made of durum wheat semolina flour and water, without the addition of any egg. They have a firm texture, perfect to go with vegetables, a simple tomato sauce or with a rich bolognese sauce. 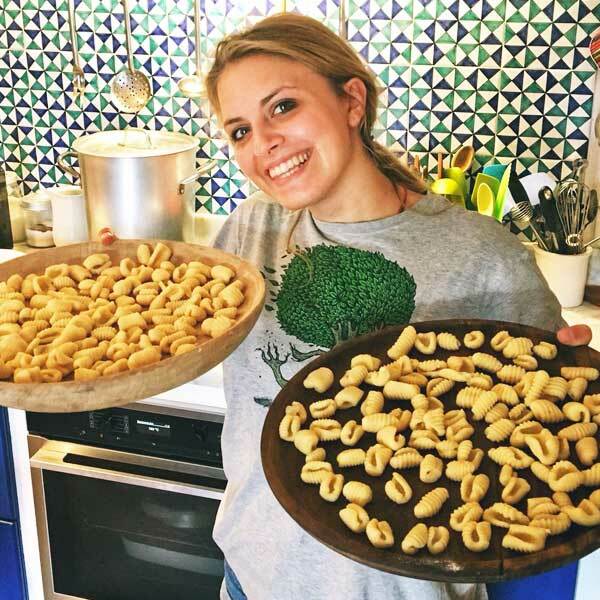 The same dough can be used to make orecchiette, so give it a try! This fresh pasta is best made with a stand mixer and kneading attachment or with a food processor. Begin by bringing the water and butter to a boil. Add the flour to the bowl of the mixer and carefully pour the hot water and butter into the bowl. Using a medium speed, allow the mixer to knead the dough for about 5 minutes. Dough should seem dry at the beginning, but kneading will give the perfect texture: elastic and smooth to the touch without sticking to the surface. When all the ingredients are combined into a ball, wrap the dough in plastic wrap and allow to rest at room temperature for 20 about minutes. While preparing the cavatelli, bring water to a boil in a big pot (about 3-4 lt). To shape the cavatelli, first lightly flour your work surface. Cut the dough into quarters and work with one portion at a time, keeping the remaining dough wrapped. With the first portion of dough, roll it into a long rope by working your hands from the middle of the dough outward toward the edges ensuring the width is consistently about a 1/2-inch thick. Using a knife or dough scraper, cut the rope into equal 1-inch pieces (about the size of the tip of your thumb). Gently roll each piece on a gnocchi board to create the cavatelli shape. This can be done using the back of a knife, pastry scraper, or your thumb. Start with the inner edge of your tool/thumb on the top of the dough piece and gently press down and drag dough towards you. The dough will naturally make a roll back on itself into a small tube-like shape. Place finished cavatelli on a dry surface, dust with flour until all dough is completed. Once the water is boiling, add a generous amount of salt to the water. Add cavatelli to the water and allow to cook for a few minutes. When cooked, use a mesh strainer or slotted spoon to drain them and and shake off excess water. Toss the cavatelli in the the sauce you prefer and serve warm.